Boudhanath (Nepali: बौद्ध स्तुपा, also called the Khāsa Chaitya, Nepal Bhasa Khāsti, Prachalit Nepal alphabet : 𑐏𑐵𑐳𑑂𑐟𑐶 𑐩𑐵𑐴𑐵𑐔𑐿𑐟𑑂𑐫, Standard Tibetan Jarung Khashor, Wylie: bya rung kha shor) is a stupa in Kathmandu, Nepal. Located about 11 km (6.8 mi) from the center and northeastern outskirts of Kathmandu, the stupa's massive mandala makes it one of the largest spherical stupas in Nepal. The Buddhist stupa of Boudha Stupa dominates the skyline; it is one of the largest unique structure's stupas in the world. The influx of large populations of refugees from Tibet has seen the construction of over 50 gompas (Tibetan convent) around Boudha. As of 1979, Boudha Stupa is a UNESCO World Heritage Site. Along with Swayambhu, it is one of the most popular tourist sites in the Kathmandu area. The Stupa is on the ancient trade route from Tibet which enters the Kathmandu Valley by the village of Sankhu in the northeast corner, passes by Boudha Stupa to the ancient and smaller stupa of Chā-bahī named Charumati Stupa (often called "Little Boudhanath"). It then turns directly south, heading over the Bagmati River to Lalitpur - thus bypassing the main city of Kathmandu (which was a later foundation). Tibetan merchants have rested and offered prayers here for many centuries. When refugees entered Nepal from Tibet in the 1950s, many decided to live around Boudhanath. The Stupa is said to entomb the remains of Kassapa Buddha. According to the history of Nepal, the palace of King Bikramaditya (Licchavi King) once stood where the Narayanhity Palace currently stands. King Vikramaditya instructed that a Dhunge Dhara should be built in the southern part of palace courtyard. But there was no sign of water from the Dhunge Dhara, for which the king consulted Astrologers. Astrologers suggested that a Human sacrifice with a male candidate having Battis-Lakshanas, or thirty-two perfections should be performed. Only the king himself and his two princes were suitable candidates. So, the king decided to sacrifice himself and ordered one of his sons to sacrifice him so that sign of water could be seen at the Dhunge Dhara. According to local mythology, during the time of sacrifice, the head flew off to a place nearby Sankhu Bajrayogini Temple. The prince then with a regretful heart, flew a hen from the top of Bajrayogini and decided to construct a Stupa where the hen landed. The hen landed in the place where Boudhanath Stupa is currently standing. During the same time, the place was struck with a Drought and the people managed to abate the scarcity of water by collecting the droplets of dew. 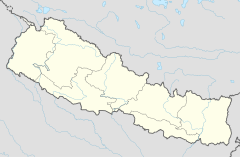 So, the place was named Khāsti as in Nepal Bhasa, "khas" refers to dew and "ti" refers to drops. Later His Majesty Government of Nepal renamed the place from Khasti to Boudhanath in order to reflect Hinduism as being the Hindu Nation. The Gopālarājavaṃśāvalī says Boudhanath was founded by the Nepalese Licchavi king Śivadeva (c. 590-604 CE); though other Nepalese chronicles date it to the reign of King Mānadeva (464-505 CE). Tibetan sources claim a mound on the site was excavated in the late 15th or early 16th century and the bones of King Aṃshuvarmā 605-621 were discovered there. The earliest historical references to the Khaasti Chaitya are found in the Chronicles of the Newars. Firstly, Khaasti is mentioned as one of the four stupas found by the Licchavi king Vrisadeva (ca.AD 400) or Vikramjit. Secondly, the Newars legend of the stupa’s origin attributes it to king Dharmadeva’s son, Manadeva as atonement for his un writing parricide Manadeva was the great Licchavi king, military conqueror and the patron of the arts who reigned ca.AD 464-505. Manadeva is also linked with the Swayambhu Chaitya of Gum Bahal. Thirdly, another great Licchhavi king Shivadeva (AD 590-604) is associated with Boudha by an inscription; he may have restored the chaitya. According to the history of Nepal, the palace of King Vikramjit (Licchavi King) once stood where the Naranhiti Palace currently stands. King Vikramjit instructed that a Hiti should be built in the southern part of palace courtyard, but there was no sign of water from the Hiti, for which the king consulted Astrologers. Astrologers suggested that a sacrifice with a male candidate having ‘swee-nita lachhyan'(स्वीनिता लछ्यन), or thirty-two perfections should be performed. Only the king himself and his two princes were suitable candidates. So, the king decided to sacrifice himself and ordered one of his sons to sacrifice him so that sign of water could be seen at the Hiti. The king told his son that a man will be sleeping by covering his face and body, and to sacrifice him without looking at his face. After the son did so, he realised he had killed his own father. With regret and guilty he consulted with priests for way to salvation. The priests suggested him to fly a ‘bwo-khaa'(ब्वःखा) a flying hen from the top of Mhaasu Khwaa Maju(म्हासु ख्वा: माजु). The hen landed in the place where the chaitya is currently standing. An Ajimaa was already located at that place before the chaitya construction started. During the time of its construction, the place was struck with a drought and the people managed to abate the scarcity of water by collecting the droplets of dew. Dew is called ‘Khasu'(खसु) and droplets are called ‘Ti'(ति). However, the emperor Trisong Detsen (r. 755 to 797) of the Tibetan Empire is also traditionally associated with the construction of the Boudhanath Stupa. The Yolmo Shakya Zangpo from Helambu resurrected Boudhanath. Princess of Nepal Bhrikuti got married to King of Tibet Songtsen Gampo. His other Chinese wife and Bhrikuti are credited for introduction and spread of Buddhism in Tibet. Along Songtsen Gampo was Trisong Detsen, first Dharma King under him. While Buddhism was spreading in Tibet, and Tibet-Nepal trade relations were being stronger, a widow Tibetan woman travelled from Lhasa to visit Khaasti. She brought her four sons and they were fascinated by witnessing how Newa people constructed chaitya, a meta-symbolic construction with distinct levels of suggestion, sagacity and profoundness. The woman’s name was Jyajhima, who took shade for many days in Khaasti. Impressed by the hospitality of Newars, she and her sons went back to Lhasa and told people stories about her experience in Nepal. She is notable as in those times, only traders and specially men were ones traveling Nepal-Tibet and back. She was fascinated by Khaasti, when she heard stories of Bhrikuti spread in Lhasa. Being a widow woman she had to ask permission from the king to visit Khaasti. Renovation of Boudhanath Stupa by local initiation. This is the major renovation after the devastating earthquake in Nepal in 2015, April. The April 2015 Nepal earthquake badly damaged Boudhanath Stupa, severely cracking the spire. As a result, the whole structure above the dome, and the religious relics it contained had to be removed, which was completed by the end of October 2015. The reconstruction began on 3 November 2015 with the ritual placement of a new central pole or "life tree" for the stupa at the top of the dome. The reconstruction project was widely criticized after the chaitya was concreted. ^ Department of Archaeology (Nepal). "Bouddha Stupa". Retrieved 3 May 2014. ^ a b Snellgrove, David. Indo-Tibetan Buddhism: Indian Buddhists and Their Tibetan Successors, 2 vols., p. 365. (1987) Shambhala Publications, Boston. ISBN 0-87773-311-2 (v. 1); ISBN 0-87773-379-1 (v. 2). ^ "Fables of Boudha Stupa and Changunarayan". nepalnews.com. Archived from the original on 2007-02-09. Retrieved 2007-07-30. ^ "खास्ति चैत्य? बौद्धनाथ ? झ्यारुङ खास्योर ?". Rukshana Kapali. 2016-09-25. Retrieved 2018-01-25. ^ "Bikram Sambat in Nepal". www.vijayvaani.com. Retrieved 2018-01-25. ^ Ekai Kawaguchi. Three Years in Tibet, (1909), pp. 35-36. Reprint: Book Faith India, Delhi (1995). ISBN 81-7303-036-7. ^ Shah, Rishikesh (1990). Ancient and Medieval Nepal. Ratna Pustak Bhandar. p. 123. ISBN 978-0-7855-0252-4. ^ Ehrhard, Franz-Karl (1990). "The Stupa of Bodhnath: A Preliminary Analysis of the Written Sources." Ancient Nepal - Journal of the Department of Archaeology, Number 120, October–November 1990, pp. 1-6. ^ Ehrhard, Franz-Karl (1990). "The Stupa of Bodhnath: A Preliminary Analysis of the Written Sources." Ancient Nepal - Journal of the Department of Archaeology, Number 120, October–November 1990, pp. 7-9. ^ "The Heritages of Nepal". Nepal heritage blog. ^ The Legend of the Great Stupa and The Life Story of the Lotus Born Guru, pp. 21-29. Keith Dowman (1973). Tibetan Nyingma Meditation Center. Dharma Books. Berkeley, California. 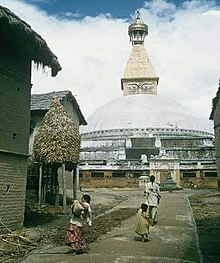 ^ "Boudha Stupa". Nepal Trekking. Retrieved 28 Nov 2016. The Legend of the Great Stupa and The Life Story of the Lotus Born Guru. Keith Dowman. (1973). Tibetan Nyingma Meditation Center. Dharma Books. Berkeley, California. Wikimedia Commons has media related to Boudhanath. Wikivoyage has a travel guide for Boudhanath. This page was last edited on 10 February 2019, at 07:34 (UTC).